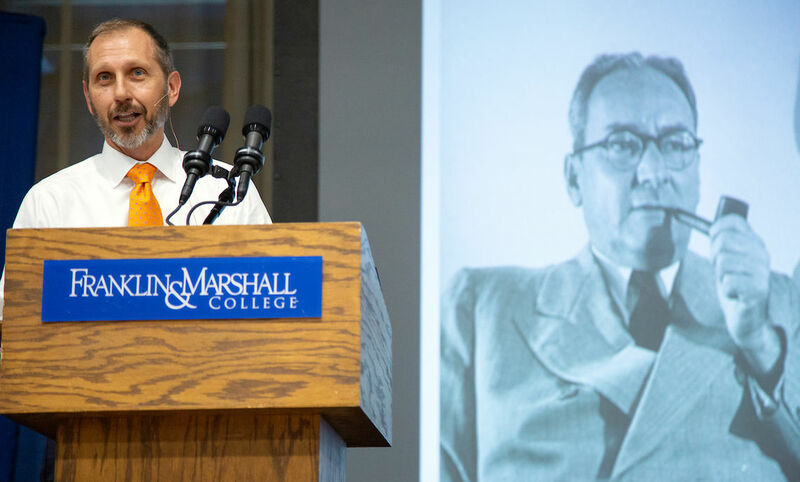 Berwood Yost, co-director and chief methodologist of the Franklin & Marshall College Poll, got right to the point in his Sept. 6 Common Hour remarks. “Can we trust polls?” he asked the audience in Mayser Gym, gathered for the campus community conversation conducted every Thursday that classes are in session during the academic year. “The answer is yes and no,” he said. “By ‘yes,’ I mean that the science of polling has proven itself time and again. In the long run, the science of polling has more often advanced our understanding than misled us, including in 2016,” Yost said. Using charts, diagrams and statistical analysis, Yost provided a primer on how pollsters collect and evaluate data. The results of their surveys reflect a snapshot of what poll respondents tell the pollster they are thinking at that particular moment. Yost cited Elmo Roper, a founder of modern polling who conducted an election poll for Fortune Magazine in 1936. Roper accurately predicted Franklin D. Roosevelt would win because he used random sampling. The established Literary Digest poll did not use random sampling and predicted Roosevelt would lose. “Elmo Roper’s polls, along with polls conducted by George Gallup, proved that the use of small, randomly selected samples of adults could offer insights into Americans’ collective attitudes, beliefs and behaviors,” Yost said. Yost asked who in the audience believed the 2016 election polls were accurate. Few hands went up. He said those polls were mostly accurate when they showed Democrat Hillary Clinton was favored over Donald Trump before the election. However, the week before the election, FBI Director James Comey’s press conference about Clinton’s emails changed voter behavior. For predicting the 2018 midterm election, Yost said three polling indicators are usually the best guide: voter turnout (which party’s voters are more interested and excited to vote), the generic ballot (which candidate do poll respondents intend to vote for in the local congressional race) and presidential approval (whether voters believe the president is doing a good or poor job). According to Yost, polls assessing the Nov. 6 election show Democrats have a clear advantage in voter enthusiasm and the generic ballot while Trump’s approval rating is well below 50 percent, which does not bode well for Republicans keeping control of Congress.